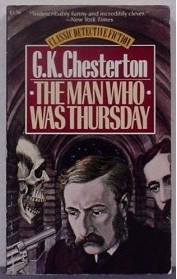 The Man Who Was Thursday. G.K. Chesterton. First, it’s great that Amazon makes older books available for free, or sometimes 99 cents. Second, Chesterton’s Orthodoxy is high on my list to read in 2010, but I thought I’d check out some of his fiction too. I can tell I am going to like him already. He is a great writer and this is a nice short read, with a few sections that certainly make you think. Overall the book keeps you guessing as to what might be going on and how things will end. And finally there is some good Christian allegory mixed in. And finally, my quotes… I need a way to get my Kindle clippings to go direct into an evernote not… I’ve seen a few scripts and hacks, but none of them look that promising. For now it’s going to be a cut and paste. But even the moon is only poetical because there is a man in the moon. He had found the thing which the modern people call Impressionism, which is another name for that final scepticism [sic] which can find no floor to the universe. Bad is so bad, that we cannot but think good an accident; good is so good, that we feel certain that evil could be explained.